To add individual events, simply click on "add to my calendar"
Go to your google calendar homepage and click on the link on the left marked "add" (just underneath the "other calendars" heading). Click the "Add Calendar" button. You are now subscribed! Any Purdue Psychology events will automatically show up. (You can hide or view these by clicking on the "Purdue Psychology" button in the calendar list on the left. In the calendar menu, click "subscribe." Click "OK". You are now subscribed! Any Purdue Psychology Events will show up. 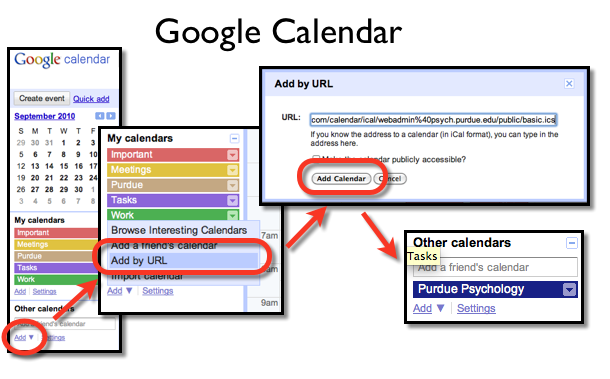 (You can hide or view these by clicking on the "Purdue Psychology" checkbox in the calendar list on the left.